What About My Passive Husband? Watch as Shannon shares some truths from her heart. Leslie Basham: Shannon Popkin notices a sinful tendency that a lot of husbands and wives fall into. Shannon Popkin: Our hearts are bent on having and keeping and taking control, and our husband’s bent is often passivity. Leslie: This is Revive Our Hearts with Nancy DeMoss Wolgemuth, author of Surrender: The Heart God Controls, for Friday, September 29, 2017. Nancy DeMoss Wolgemuth: We’re continuing our conversation today with Shannon Popkin, who’s a wife, a mom, a blogger. She blogs sometimes at the True Woman blog. If you don’t follow that blog, you need to. Shannon and many other women contributors write some great posts there for women in every season of life. Go to ReviveOurHearts.com and look for the True Woman blog. There's lots of great wisdom there. So, Shannon, you’ve been a part of our ministry for a number of years doing that. You’ve written a book that we’re talking about this week, that I think touches into something that’s very deep and personal and important for all of us—as women, in particular. 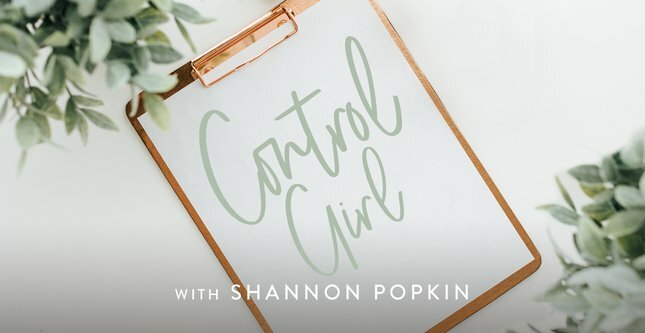 It’s called Control Girl: Lessons on Surrendering Your Burden of Control from Seven Women in the Bible. I appreciate how vulnerable and honest you are about your own battle with control, and that it was kind of your own challenge in that area that drove you to the Word—which is where all our challenges should drive us, to the Word, to find answers. Thank you for letting God deal with you in this really difficult area; thank you for writing about it! We’re making that book available to our listeners this week for a donation of any amount to help support the ministry of Revive Our Hearts. It’s a message I think we all need, in different ways. But I imagine women who have been listening to this conversation are maybe having some questions, some push-back. We like having these conversations, so the listener feels they’re at the table with us and can engage with us. I think, sometimes, we think, If I’m not gonna be a control girl [and you’re talking about surrender as the antidote to that], that means I’m just going be this placid, quiet, little woman with no opinions—ditzy or dumb or something! That’s not what we’re talking about! Shannon: Oh, no. That’s not who God made me to be. I can’t be that person, even if I wanted to be! But I think it’s a new version of ourselves. Instead of being doggedly determined and persisting for our own viewpoints or our own ideals . . .
Nancy: Which, by the way, is what the world encourages us to be. That’s considered a virtue today: to claw and dog and fight and push. "Lean in" is a popular phrase. “If you don’t stand up for yourself Girl, Sister, nobody’s going to!” We’re getting that message pretty constantly. You’re saying that’s different than God’s message for us. Shannon: Yes! When we take those attitudes that the world would celebrate—that pushy dogmatism—when we take those and bring those into our homes and our families and our workplace and our relationships and our church, they just create tension. They create distance. People pull away! They don’t tell us what they really think. Nancy: Because they’re afraid to. Shannon: They are. It doesn’t create the peace that we’re really hoping for when we try to take control. Nancy: The Lord started pointing you to women of the Scripture, first through Eve. Tell us how you started to think about her in relation to control issues. And so, for me this was like being diagnosed with this degenerative disease! Piper was explaining that there’s this desire that I’ve inherited from Eve—this desire to take control. I didn’t understand that before; I had not put that together. So no wonder I was being this horrible wife and mom, trying to control everything! No wonder I just couldn’t let it go. No wonder, when that desire just welled up inside of me, I was becoming this person that I didn’t want to be! It’s because I’ve been cursed with this desire. It’s not a good desire. It’s a desire that is a result of the Fall. Nancy: In fact, Eve didn’t set out to have this messed-up, dysfunctional thing that she would pass on to the entire human race. When she first saw that fruit, it looked good, it looked attractive, it looked appealing. . .and it looked like it offered something that she didn’t have, which was to be like God. So the curse we’ve inherited is the curse of sin, which is a drive to want to be our own god, and to be “god” over everything and everyone else around us. Shannon: Absolutely, yes, it’s as if God said, “You want to take control? I’m going to let you be controlling.” If you back up before they ate the fruit, it’s interesting that God put this tree in the middle of the garden. This was the only rule that He had for them: “Don’t eat this fruit!” He didn’t put the fruit ten feet up, covered with prickers. He let it hang there dangling, beautiful in the sunlight. He was asking them, “Will you be content with letting Me be God and you be living in surrender to Me, to God?” Of course, we know the rest of the story. Eve wasn’t content with that; she took the fruit. The curse was spoken over her. And this desire is something we live with yet today, this bent in our hearts toward wanting control. It’s a result of the Fall, of the curse. Nancy: A lot of times, that longing—that drive in us to be in control—is feeling that maybe God is keeping something from us. Sometimes when we feel that God is taking something from us or keeping something from us, He’s really trying to protect us from something that we can’t see and we can’t imagine. Shannon: Yes. My husband had a job offer years ago, and we were so excited about this job. We were going to move to this new location, and we even had our house on the market. And then, the employer retracted that offer. Years later, a friend called me. This girlfriend’s husband had actually set up the interaction between my husband and this new employer. She called and said, “Shannon, God protected you!” Some new things had come to light with this employer. Eventually we learned that he was a dishonest man. He has sexual assault allegations against him. At the time, when we had the job offer, he looked to me to be the perfect employer for my husband. He looked like such a godly man. I thought it was the answer to my prayer, that my husband would have this godly mentor. To me, it looked perfect, but God had such a bigger broader perspective. I think He led us right into that situation so that I could learn something about how limited my viewpoint is! I could learn to trust a God who has control over situations. I can’t even see beyond the next little hurdle, where He sees beyond the tallest mountains! He sees the whole landscape of what He’s doing in my life and in all the lives around us. Nancy: Which takes us back to faith—trust—believing that God is in charge. Nancy: He’s good. He knows what He’s doing. He doesn’t make mistakes. I don’t have to fix everything—or anything—or make it what I think it should be. How do you, as a wife, process and encourage other women to think about this whole thing? You think about Adam and Eve, you think about your own marriage, what do you do when your husband’s not stepping up to lead? Shannon: Well, I think it’s really interesting, too—in that scenario with the garden—that the serpent talked first to Eve, because God had ordained this order: He created Adam first. He gave Adam the instructions about the tree before Eve was even created. And so, when the serpent comes on the scene, you would think the natural thing would be is if he would address Adam and say, “Hey, about this tree rule . . .” But instead, he goes to Eve. Nancy: That was intentional for sure. Shannon: It was. Whatever God puts in place, the enemy will try to upturn it, will try to destruct it and tear it down. And so, the fact that God has given the husband the role to lead his family, that’s what our enemy wants to tear apart and destruct. So our enemy would say, “You have to take control! It’s good and right for you to take control!”—and he would often tempt our husbands into passivity. As we see Adam right there in the garden, we wonder, Where is Adam in this scene, anyway? At one point, the passage says she gave the fruit to Adam . . . who was with her. And so, he’s there. Why didn’t he step in front of that serpent and say, “No-o-o-o! Don’t do it! You’ll die!” There’s passivity, and so, both roles tend to do exactly the opposite of what God designed for us. I think that if we are going to be women who are surrendering to God, it starts with surrendering who He designed us to be in this relationship. Nancy: If we insist on—in every circumstance and situation—taking the reins ourselves, our husbands probably won’t. Shannon: No, they won’t. They aren’t going to fight us for that. My husband has enough battles at work—and a long day at work. When he steps through the door, if I’m battling with him about where he puts his shoes or where he puts his coat, he doesn’t have the energy for it. He will let me take control if I will take it. I think our hearts are bent on having and keeping and taking control, and our husband’s bent is often passivity. I think both of the sexes have to fight against our natural inclination. I think it does help to remind myself that the more I take control, the less my husband’s going to want to take control. He’s content with letting me take that. But if I will embrace what God has sovereignly put in place—if I will invite my husband to lead, ask his input, get his instruction on things. This invites him into the leadership role, and he’s much more willing to take it. I have a girlfriend who had some tension in their marriage. Her husband was really checking out of parenting. He was always in the basement tinkering with his hobbies, and she felt like she was upstairs trying to manage the mess of the household. Their relationship was strained. So I encouraged her, “Start inviting him to lead, to give some direction to the family.” She said at that point they had, I think it was a two-year-old, who wasn’t gaining weight. And the doctor was concerned about this. What she started finding was, the more that she invited him into different little decisions—into giving leadership in the home—the more he wanted to be a part of it, the more he wasn’t down in the basement tinkering with the hobbies anymore. He was upstairs; he was invested. He was seeing how much work it took to take care of the children. Nancy: He was and feeling needed. Shannon: He was feeling needed and wanting to invest. Nancy: I think it activates something in a husband’s heart, to know that he can be a hero. Shannon: And this is what we’re often longing for. We want him to be the hero, but if we just try to do it all ourselves and be the martyr about it, we’re not going to activate that hero in our husbands. Nancy: Right. To bend towards surrender to God and to our husband’s leadership is not like a once-and-for-all thing—we get it figured out, and we all go on into “happy ever after.” I think this is a constant temptation—to want to re-take the reins, to be in control, to overstep the bounds that God has put around us, and to make a battleground where God wants us to have intimate, close, mutually satisfying, serving relationships with each other. God’s not saying to the husband, “Lord it over the wife.” That’s not, at all, what it means for him to lead. But He’s also telling us, “You’re not supposed to lord it over your husband!” And that seems to me—after now, almost two years of marriage—something that is a continual learning and growing process. Shannon: It is. Often when I see the weaknesses in my husband, when I see something that frustrates me, it just brings out this desire to control him, to control our family, to control the situation. Nancy: And aren’t we thankful, by the way, that our husbands don’t do that to us—sometimes—in the way we do to them? What we’re needing is really grace-filled relationships, marriage and otherwise. Shannon: Absolutely. There was a time, when my children were small, that we walked into the family room and there was this bat—the fuzzy, scary kind of bat. Nancy: That you don’t want in the living room! And I said, “Then what did you do?” I was imagining that he would hammer it over the head with a shovel and bury it six-feet under. But no . . .
Shannon: Get rid of the bat! No, he had just left it there. And right at that point, my toddler leaned over and tried to pick up something in the yard. I whooped into the yard and yelled, “Kids! Get into the house!” (probably a little over-dramatic). And I said, “Well, did you see it fly away? Did you, did you?” And I got in his face, pointing my finger. Again, another ugly scene from my life. And I said, “I want you to go out there and look over every square inch of our property until you can assure me that there’s no bat in my kids’ play area!” And I think this craving for control . . . A lot of wives and moms would really struggle over safety and cleanliness and wanting to control those things. And yet, the more that I move in aggressively, the more he just retreats, and the more chaos and tension there is in our home. I took this beautiful sunny day, where the kids were playing and we were drinking lemonade, and I just upturned it! And there was hollering with the kids, and I was yelling—and my husband was frustrated. I think this desire for control—it does not produce the kind of marriages that we’re hoping for. It doesn’t produce the kind of parenting that we want for ourselves. It doesn’t produce the kind of people that we want to become. Control leads us in the opposite direction than we want to go. And so, I think if we don’t want to become more and more controlling, we’re going to have to reverse this tendency that we have—this curse in our hearts—to take control. Nancy: And what I love about Genesis chapter 3 . . . This is where the Fall is first described. This is where the beautiful picture of Genesis 1 and 2 becomes this ugly, horrible mess—dysfunction and pain and guilt and hiding and fear and shame, and all of this. But Genesis 3 is also where we find the first telling of the gospel . . . the foreshadowing of the gospel! It’s not told in totally clear tones or colors, but God says to the man, to the serpent, to the woman, “Here are going to be the consequences of your choice.” But then He says to the serpent, “I will put enmity between you and the woman, and between your offspring and her offspring . . .” (v. 15). He's talking about the coming Messiah. Now, she didn’t know that’s who He was talking about at that point. But then God says to the serpent, of Jesus, “. . . he shall bruise your head, and you shall bruise his heel.” This Messiah will suffer because of our sins, but who will deal the final fatal blow to the head? It will be Jesus, the Victor over Satan! Eve says, “I’m in control!” But Mary says, instead (Mary of Nazareth, we’re talking about), “God, I surrender myself to You.” And God places within her the life of His Son, Jesus Christ, promised back here in Genesis chapter 3, to redeem and rescue us from the curse of the Fall, from that drive to control. He says, “I’m here to control. I love you! I’m here to fix what is broken, to heal, to redeem, to make all things new.” He reversed the curse in our hearts and in our relationships. That’s what He came to do, that’s what He wants to do, that’s what He promises to do! This says to me that there is hope and help for messed-up control freaks. Shannon: Yes, absolutely. Jesus did come to reverse this curse, to lead us in a new direction. So if we look at the garden and how the curse was put into play in the garden—and we want the reversal of that—a good place to look is another garden . . . the Garden of Gethsemane. Jesus is the ultimate picture there of surrender, right? He was facing the cross; He knew it was coming. He was telling everybody else, “It’s right on the other side.” He could have avoided it; we know that He could have evaded it. He could have called angels to rescue Him. Yet, as He faced the cross, He said, “Not my will, but yours, be done. Would that this cup would pass from me. Nevertheless, not my will but yours be done” (see Luke 22:42). Nancy: Which is exactly what Adam and Eve should have said, in Genesis chapter 3, but they didn’t. So here comes Jesus, the Second Adam, the Perfect Adam, the One Who perfectly obeyed the will of the Father. He is not only a model for us of obedience and surrender, but the One who came to save us from our disobedience and to live within us by His Holy Spirit, so we could be surrendered. Shannon: I love it that He went first in this process of surrender. When I picture myself surrendering, I picture hands lifted, serenely worshiping, a beautiful song playing. I don’t picture the gritty battle. And He invites us to this freedom from the curse, this freedom. It’s not a downhill, easy path. It’s an uphill, gritty battle of battling against my own desire for control. But it's also saying, “Little by little by little . . . following Jesus . . . step-by-step. Galatians says, “Walk by the Spirit.” It's a step-by-step-by-step saying, “Not my will but Yours be done; not my will but Yours be done . . .” This is what transforms us. This is what changes us from control girls into Jesus girls, when we follow Jesus in this way. Leslie: That’s Shannon Popkin. She’s been speaking with Nancy DeMoss Wolgemuth about giving up control in our marriages and relationships and trusting God. To get Shannon’s book, Control Girl, you can visit our website, ReviveOurHearts.com. When you donate any amount to help keep this program coming your way, we’ll send you a copy of the book. Again, the web address is ReviveOurHearts.com, or ask for Control Girl when you call 1–800–569–5959. Today’s a big day for ReviveOurHearts, and women who are gathering in Indianapolis for the Revive ’17 conference starting today. You can see the whole thing on livestream by visiting ReviveOurHearts.com. Wake up! That’s the challenge Nancy’s going to offer all of us next week. She’ll return to our series on the letters to the churches in Revelation. Please be back for Revive Our Hearts. Revive Our Hearts with Nancy DeMoss Wolgemuth wants to help you thrive in Christ. The program is an outreach of Life Action Ministries.